Yesterday, I was outside in a cardigan, lugging an unnecessary winter coat with me. Today, there’s a blizzard going on. 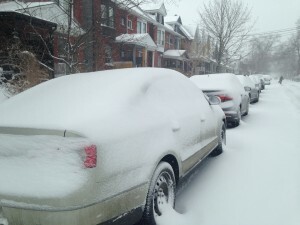 March can be a cruel, cruel month where I live (Toronto). We all know better than to get our hopes up when we get those few warm(er) days . They don’t mean that winter is actually, finally over. They’re a brief reprieve, a misleading moment. But they make us all the more bitter when winter comes roaring on back for a bit longer. I’m working with a client that’s in the early stages of a massive change initiative. There are ambitious plans on the table. There is urgency to figure this out – the alternatives are not attractive. By this time next year, things should look and feel different. But right now, they have that feeling that their winter – this feeling like they aren’t getting on with things fast enough – is going to last forever. So how can we battle through these last snowy days to get to the warmer days ahead? It’s hard to stay motivated. It can be discouraging. We are often working on things that are vague and complex, where the end result is not all that clear. It can feel rather like shoveling a foot of snow when it’s already too late to get a plane ticket south for spring break, because spring break was last week. Spring might not turn out to be all that delightful, in the end. It might be chilly, rainy, and all too brief. But spring will in fact come, no matter what you or I or anyone else does about it, and at this point it would have to rain a lot for me to complain, speaking just for myself. Organizational change doesn’t work that way. We have to make spring happen. We have to create it. Otherwise it’s one of those fairy tales where winter lasts forever until someone wakes up or says the magic word. We’re the ones who are responsible for making change happen. There’s nothing inevitable about it. Plenty of organizations go under. Plenty of organizations fail in achieving their objectives. To get out of the endless March blizzard we may feel like we’re in, we have to make the change happen ourselves. But how? We can’t kid ourselves about where we are in the change process. It’s important not to mistake planning for doing. With this client, we are in the early stages. For a lot of the initiatives, we are still figuring out what done looks like, let alone how “done” would affect our ultimate objectives. For some people, this is a great time – we get to think creatively, we get to confront the possibilities and start to figure out how to forge ahead. But not everyone feels this way, certainly not at the same time. When we’re in the midst of a change effort that’s not yet bearing fruit, it’s all the more important to have a plan and stick with it. You’ve planned the work – now work the plan. Go ahead and count phone calls or make to-do lists that include a few things you’ve already done. Just keep on. In the middle of a harsh winter, it helps to see the sun. Sometimes we need to be reminded that things don’t have to be the way we are experiencing them forever. When we’re in the middle of the beginning of a change initiative, it can be particularly helpful to connect with those who’ve been there. Who can tell you an encouraging story? Talk to them. Get some perspective. The first robin! The first flower! Just as we get all excited about the first signs of spring, it’s a great idea to celebrate even the delicately inconclusive signs of progress you start to see in your change initiative. Don’t get overexcited – a single snowdrop is not a field of poppies in bloom quite yet – but do mark the things that show you that you’re gaining momentum, you’re seeing change take root. If you’d like to discuss how we can help you begin or sustain your own change efforts, please get in touch.